Five tries to two and a 25-point margin were enough for Heriot’s to finally beat Currie at the third time of asking this season. The home side made a statement of intent by kicking an early penalty for the corner rather than goal but the lineout and rolling maul eventually foundered on resolute defence. But Heriot’s kept coming back. Charlie Simpson touched down on the right. Full-back Ross Jones missed the conversion but added a simple 20-metre penalty. Chieftains got into the Heriot’s 22 for the first time after 20 minutes and their rolling maul produced a try for prop Matias Argero. Stand-off Gregor Hunter couldn’t convert. 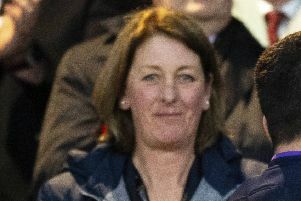 Currie had lost their entire starting front row before the half was out as the Heriot’s pack laid the attritional ground for a second try by Simpson, who chased down a kick through to score wide on the left wing. Jones failed to add the extras and it was 13-5 at the break. Heriot’s had a third try as a scrum nudged forward and replacement Jason Hill came off the back to crash over. Jones converted. A frustrated Currie began to throw the ball about in the hope of rescuing the game but Heriot’s had a firm grip and were not about to let it slip. 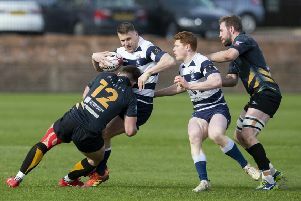 Jones landed a long-range penalty to increase the margin before Currie’s Tom Gordon barged over for a second try that was too little too late as Heriot’s cancelled it out with a try by inside centre Bobby Kay at the other end. Heriot’s sealed it when replacement scrum-half Alex Ball seized on a loose ball and sprinted half the length of the pitch for a fifth try.